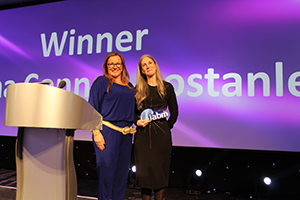 Birmingham, UK —07 December 2018 — IABM has announced the winners of its highly-prized annual awards at the IABM Annual International Business Conference, which took place in Birmingham, UK on 6th and 7th December 2018. 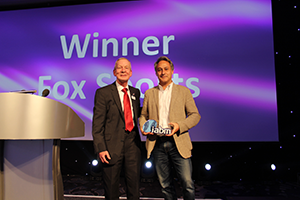 The awards recognize outstanding achievement in 2018 in key areas of the broadcast and media technology industry: the fostering of young talent; outstanding women in broadcast; technology leadership; technological innovation; broadcaster/media company innovation; and creative collaboration between technology vendors and end-users. 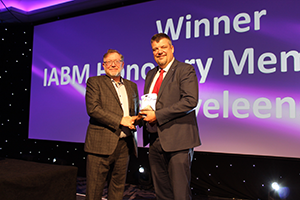 A final award – Honorary Membership of IABM – is made to an individual who has played a major role in the development of the industry and contributed to the advancement of IABM over the course of their career. 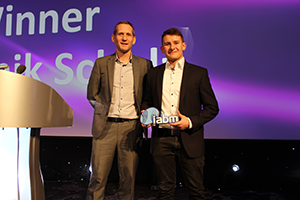 A student at RheinMain University of Applied Sciences, Dominik was one of the IABM-sponsored students attending IBC and his submission from that event demonstrated excellent use of the opportunity. In his report he provided a detailed account of how the industry is changing and the key developments shaping the future. He achieved this through an intensive schedule of time spent in the conference, the exhibition, the future zone and discussions with industry experts. He covered many topic areas including new image formats, camera technology, virtual and augmented reality and immersive audio. Dominik is clearly a rising star and one to watch out for in the near future. In Dominik’s own words: “As a media technology student my visit to IBC made me just dream a little bigger about an exciting future in the broadcast and media industry”. Video Indexer (VI) is an artificial intelligence service that provides an orchestration of multiple and customizable machine learning models based on multiple channels (voice, vocals, visual), to extract deep insights with no need for data analysis or coding skills. VI enables deep search, reduces operational costs, new monetization opportunities, new user experiences and more; on large archives of videos with low entry barriers. It also enables easy integration with a customers’ existing infrastructure via a REST API and ready-made embeddable widgets. For its FIFA World Cup coverage, FOX Sports wanted to send live video from Russia to editors and producers in Los Angeles for quick packaging and turn around to air in live shows being hosted in Russia. In essence, the network wanted to achieve the appearance of a live broadcast fully staffed on-the-scene, without the majority of the staff actually on-scene. To accomplish this technical feat, FOX Sports convened Reach Engine by Levels Beyond, Amazon Web Services (AWS), IBM Aspera, Telestream and CenturyLink to build an integrated solution that would allow the network to keep its entire post-production team at its Los Angeles media center. “The process of sending video from Russia to L.A. and back in edited form was seamless thanks to all the tech companies participating, and represents a giant leap in sharing live events with audiences halfway across the planet within moments of the action taking place,” said Levels Beyond CEO, Art Raymond. As a founder of AIMS, and Chairman of its Board, Michael has been a driving force in inspiring the industry towards a clear, efficient path to standards-based, interoperable IP. IABM is delighted to present this new award in association with Rise, the not-for-profit, advocate group for women in the broadcast manufacturing and services sector, dedicated to the promotion of gender diversity in the industry. Rise aims to open up more opportunities for female broadcast professionals through holding quarterly networking events, seminars and a yearly mentoring programme. Dr Glodina Connan-Lostanlen, PhD, MBA, began her career in the broadcast industry in 2001 with Harris Corporation, rising through sales and business development roles to become Director of Product Marketing in 2012. In 2015, Glodina was appointed Chief Marketing Officer of Imagine Communications, and in April this year, became SVP & GM Americas Sales & Services. Aubrey Russell has designed and built streaming workflows and master control rooms for clients such as Warner Music Group and Classpass Live. Her launch team for Classpass Live was fully female; Director, Technical Director, and Audio Engineer. At Live X, Aubrey manages a team of nine producers who are shaping the future of the broadcast and streaming industries every day. She is proud to have strong women on her team. The best way to prepare the next generation of engineers, men and women, is to give them role models. Aubrey has built a team that is worthy of that. “Being under 30 and managing one of the most promising teams in live production makes Aubrey very notable. As one of the few females in her field, let alone in a leadership role, Aubrey strives to encourage and promote the women on her team and continue to normalize the idea of women in tech,” said Nick Micozzi, VP of Engagement at Live X. New for 2018, the Broadcaster/Media Company Award recognizes and rewards broadcasters or media companies that have demonstrated throughout the year that they are at the forefront of creating and distributing ground-breaking content through innovation across the content chain. 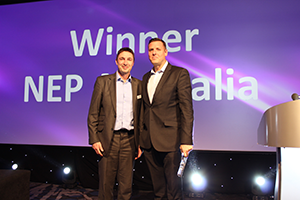 NEP Australia wins the 2018 Award for its continent-wide and intercontinental IP remote production, with two hubs – Sydney and Melbourne – connecting with 29 sporting venues utilizing over two thousand SMPTE ST 2110 links. “The consumption model of broadcast is changing. People want everything anywhere, all the time. To keep pace with this trend and allow Fox Sports Australia and other stations to produce ever more high-quality content with their most talented people, NEP Australia broke away from the limitations of siloed operations. NEP’s new Andrews Hubs in Sydney and Melbourne—the most technically advanced facilities on this scale in the world—enable multiple concurrent outside broadcasts via IP,” said Christian Scheck of Lawo, who nominated NEP Australia. Jan Eveleens joins an exclusive club that is a veritable ‘Who’s Who’ of people who have made a major impact on the broadcast industry as it has grown and developed over the last 40+ years. 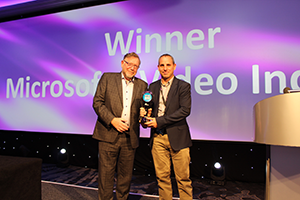 “As well his influential role in our rapidly changing industry, Jan Eveleens has also made an enormous contribution to the development of IABM,” said Peter White, IABM CEO. “I will always be grateful to him for his guidance and support from the first moment I joined IABM; he richly deserves the recognition that comes with IABM honorary membership, and I look forward to continuing to work with him in the years to come.” Read the full press release on Jan Eveleens. “Transformational technology and inspiring people continue to drive our industry forward. Our award winners this year have all made great contributions to advancing the art and science of broadcast and media, helping to secure our industry’s ongoing success in the process. 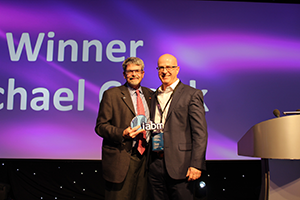 Our aim at IABM is to continue to foster excellence and collaboration and provide our members with all the tools they need to succeed as the pace of change in our industry continues to accelerate,” IABM CEO Peter White concluded.